When we consider standards-based reform, we expect that our students will converge and have similar learning outcomes; however, it is not that simple. We need to account for inclusion, which naturally brings a divergence of student learning styles and challenges. As stated in the Introduction, teachers are being called upon to produce greater similarity in learning outcomes, despite greater diversity in student populations. In this chapter, we will address the second element of the MMECCA framework, the MATERIALS of instruction, or the tangible items, that are used to support instruction and create outcomes for our diverse students. Materials in the typical general education classroom tend to be limited in scope. Commonly found supplies such as textbooks may be supplemented with student workbooks or worksheets. Sometimes manipulatives and specific multimedia such as number-line sets for math, a globe for social studies, or videos, software, and Internet resources may be used to support learning. These tools typically function as add-ons to the curriculum rather than as an embedded tool for delivering the curriculum. Many schools and districts do not have the funds to purchase these add-on materials. Students in those districts have few options that can be matched to their learning styles or diverse needs. Alternative formats of basic materials can also be provided for students with disabilities, such as Braille texts for students who are blind, large print text for students with low vision, and CDs with audio output for students with dyslexia (Rose, Meyer, & Hitchcock, 2006). Materials in a Universal Design for Learning (UDL) classroom are different. These materials will be used to give students multiple means of representation of concepts, multiple means of engaging in learning the concepts, and multiple means of expression for students to demonstrate what they have learned. In a UDL classroom, instruction is more flexible and provides accessibility for all students. Teachers who use the principles of UDL in their classroom recognize that instruction does not come as a one-size-fits-all design. For example, digital content can be presented in different ways to meet the learning needs of each student. This content can include adding hyperlinks and glossaries. It might also include graphs, animation, and videos linked within the body of materials to aid understanding and expand content experience to demonstrate a concept (Rose, Meyer, & Hitchcock, 2006). The UDL principles help teachers create classrooms where students can use technologies to move beyond being academic observers. These principles provide a model for self-actuated learning and universal access for all students. Regardless of students' disabilities or differentiated learning styles, every student needs and has the right to access the curriculum (Nelson, 2006). UDL should be part of the initial design of the curriculum, learning environments, and assessments. Pisha and Coyne (2001) call this approach "smart from the start." The following list includes several Web sites that will further your understanding of UDL. In the Introduction, we discussed some of the founding principles of UDL. It is interesting that this term originated in the field of architecture. The tenets for UDL were created to ensure universal access for individuals of all capabilities. Over time, it became obvious that the designs that were originally intended for individuals with disabilities were helpful to everyone. For example, push bars or lever handles for doors replaced traditional doorknobs. This universal design has become helpful to people without disabilities when they carry large parcels, heavy briefcases, or use cell phones. You can learn more about these tenets at the Center for Universal Design's Web site at http://design.ncsu.edu/cud. When we use UDL principles to build the curriculum and select materials for the classroom, all students will have equal opportunities to learn. These statistics remind us that it is important to use multisensory material whenever possible. It may not be feasible to use multisensory material for every lesson you teach. As you vary how you present information in your classroom, students will be more engaged in the learning process. Improved student engagement will result in improved achievement. Figure 2.1 shows examples of multiple ways to engage students in diverse classrooms. From Garguiulo/Metcalf. Teaching in Today's Inclusive Classrooms, 1E. © 2010 Wadsworth, a part of Cengage Learning, Inc. Reproduced by permission. www.cengage.com/permissions. Reading instruction in the early elementary grades is focused on learning to read. As children graduate into upper elementary and middle school, the focus shifts to reading to learn. Diamond and Moore (1995) discuss the importance of organizing classrooms to foster partnerships and collaboration among diverse students as they talk, listen, read, think, and write. These collaborations include providing students with experiences that allow them to read to learn. In the next section, we will discuss several important areas to be considered with respect to print resources—visual enhancement, cultural plurality, dictionaries, and other aids. Providing indicators in the story line to help them anticipate and predict the content of the text. Improving their comprehension with visual information that can be more accurately interpreted than language-based information. Supporting their ability to recall and retell the story. Many students remember illustrated information for greater lengths of time than text-based information. Graphic novels are another print resource to use with struggling readers. These novels are similar to comic books, but they have longer and more complex stories. Graphic novels provide the same benefits as illustrated books and are available in electronic formats. Check the illustrations. Look to see if the illustrations depict a broad range of human diversity, such as race, ethnicity, and gender. Look for stereotypical depictions. Which characters are doing what in the illustrations? Are females and people of color consistently depicted in subservient or passive roles? Check the story line. Are persons of color or individuals with disabilities required to have superhuman qualities to gain acceptance or approval? Are these characters framed as "the problem"? Are these characters able to solve their own problems or must a white, male, or non-disabled individual come to the rescue? Is the status of the female characters based on their own initiative and intelligence? Or are they dependent upon their good looks or to their relationship to male characters in the story? Consider the author's perspective. No author can be totally objective. Has the author created a balanced story? Does the author's perspective seem overly patriarchal or feminist? Is the story solely from a Eurocentric perspective? Are diverse cultural perspectives included? When we are aware of these elements, we can provide reading materials to our students that reflect the ideals of culturally responsive instruction. The resources list at the end of this chapter includes sources that can help you select appropriate reading materials. Electronic dictionaries are a great multimedia support for children with writing challenges. They come in multiple formats, and students can experiment with different versions until they find one that fits their needs. Electronic dictionaries are easier for most students to use than the traditional print version. For diverse students, electronic dictionaries provide helpful features such as auditory assistance for pronunciation or verifying words that students are seeking. Skype and iChat are software applications that allow you to explore virtual opportunities such as bringing guest speakers to classes. These programs open up endless opportunities for students to communicate with experts or children from many countries and cultures. You can link to these services from anywhere in the world. For example, by using virtual docent programs, you can pre-arrange a meeting and connect to wonderful tours, lectures, and question-and-answer sessions. These content-rich experiences give students engaging and valuable opportunities for learning. Let's take a look at how Mr. Hogan uses content-rich experiences in his classroom. Mr. Hogan is a 5th grade teacher at a school in a low socioeconomic neighborhood. Eighty five percent of the students in the school qualify for free or reduced-priced lunches. Ninety percent of his students are minorities and three students are ELLs. Mr. Hogan is certified in elementary and special education and 45 percent of his students have disabilities, the maximum allowed within education laws and mandates. Mr. Hogan is proud of his students. They have worked well in collaborative learning groups throughout the year with great success. At the end of the year, Mr. Hogan and his class are completing a unit on ecology in jungle environments, and he decides to schedule a trip for his students to visit the local museum of natural history and meet with the educational team and docent. He is aware that most of his students have never visited the museum due to financial and transportation barriers. Mr. Hogan believes that this trip will be beneficial to his students' life experiences. Unfortunately, the trip was denied due to the school's limited funding. Mr. Hogan decides to explore the possibility of a virtual field trip. He has heard other teachers talking about these types of trips, and he wonders how it will work in his very diverse classroom. When he contacts the museum, they inform him that they would be glad to help with this project. They tell him that the museum has a Web site with a virtual tour as well as a listing of museums around the country that have virtual habitat exhibits. Mr. Hogan is delighted and proceeds with planning. The film director is responsible for capturing images for the group presentation. Videos can be downloaded from YouTube, TeacherTube, Google and still images can be downloaded from a museum's or zoo's Web site. The director will load these videos and images to the wiki for review. After all group members give feedback on their preferences, the film director edits the media resources on the wiki. This role would be a good choice for a child with disabilities because these students typically thrive in a technological environment. The recorder is in charge of recording the dialogue that will be used to narrate the presentation and compiling all contributed material. The recorder will create a wiki page that lists all the contributions that are expected from all group members. This role is a great role for a student with strong writing skills. The wiki director will develop the group's Web presence. This responsibility includes creating an engaging appearance and working closely with the recorder to include accurate information. The recorder will provide most of the written work to support the wiki director. This would be another good role for a child with a disability. The spokesperson will be the primary presenter for the group. This role includes making arrangements with Mr. Hogan for the group's interaction with the museum personnel, gathering questions from each group member, recording and archiving audio files of the conferences and the group's presentation, and posting files to the wiki in collaboration with the wiki director. The trip coordinator works closely with Mr. Hogan to ensure that the group is tuned in when they need to be. This person is responsible for posting directions on the wiki for all needed resources. The trip coordinator will also coordinate with the ESL teacher to make sure that all information is presented in other languages as necessary. This role will require organizational skills and can be filled by an ELL student. With technology, there is a place and role for everyone! Meaningful manipulatives are multisensory tools that are very beneficial for students with diverse learning styles. Earlier in this chapter, we talked about globes and number lines as examples of manipulatives. Working with manipulatives can be more like an integrative brain function when used in motion-centered experiences. TouchMath is a good example of one such set of tools. For this multisensory math program, students begin by using concrete materials such as beans or pieces of cereal to practice counting. Students soon move on to touching points on the manipulated numeral set and other materials that come with the program. Over time, students are able to learn the content by simply using other surfaces for tapping out numbers or using visualizations of previous problem-solving techniques to help them remember math concepts and calculations. For more information, you can log onto www.touchmath.com for free downloads and videos. Auditory materials come in an increasing number of formats and can be classified in multiple ways. MP3 players are very popular, pocket-sized devices that play music and other types of audio recordings. Students can use them to play podcasts such as archived recordings from their classes or information transferred from other sites. MP3 players provide flexible access and give students the ability to repeat recordings for clarification and additional information. Many electronic books are available as free downloads in MP3 formats for pleasure or extended learning opportunities. Amazon offers the Kindle 2, which delivers text-to-speech playback for an extensive list of books, newspapers, and blogs. You can also use this device for your own documents. This device opens up many additional avenues of access for students with reading challenges. The National Instructional Materials Accessibility Standard (NIMAS) requires textbook publishers to produce standard source files that allow their publications to be easily translated into talking books, Braille, and large-print formats. For students who have challenges reading print, alternative formats help them with their reading difficulties. NIMAS was established as part of the reauthorization of Individuals with Disabilities Education Act (IDEA) in 2004. NIMAS provisions apply to students with identified print disabilities who have an Individualized Education Program (IEP). Check out the NIMAS site (http://nimas.cast.org) for more information and program updates. Bookshare is a partner with NIMAS and the U.S. Department of Education and offers many audio book options. You can visit Bookshare at www.bookshare.org. 49 percent of students may be interested in pursuing careers in technology. 28 percent of high school students access foreign news services via the Internet. 94 percent of teens use the Internet for school-related research. Students spend more time on the Internet than they do watching television. The largest group of new users of the Internet from 2000–02 were 2- to 5-year-olds. Today's students feel technology is an essential and preferred asset in every part of their lives. Today's students are ultra communicators. Computers can help students increase their performance on standardized tests. Technology can increase students' motivation and improve their self-concept. For educators, it is essential to blend these facts into the teaching and learning process. What is Web 2.0? This term generally refers to a group of new Internet applications that promote the use of, contribution to, and creation of information. Blogs, wikis, podcasting, and social networking are some of the most widely used applications (Churchill, 2007). Blogs—Students can use blogs for discussions with friends or other groups of individuals. They can be integrated as digital bulletin boards where students can share, self-evaluate, and participate in group evaluations and feedback sessions. Students can also include art and photography on their blogs. Blogs also hold great promise for use in journaling in student activities (Utecht, 2007). Wikis—Wikis are Internet-based collections of information that can be as expansive as Wikipedia or as simple as compiling information into a camping trip organizer. Teachers can use wikis for adding information to research topics, posting outstanding student work, or reporting news to parents on a bulletin board. You can visit Wikispaces at www.wikispaces.com to build a wiki to support your classes. Podcasting—Podcasts are easy and affordable audio recordings of activities or presentations that students can listen to on their personal MP3 players. Students can use podcasts to access new information, record their own presentations, and review content that is presented or archived in this format. Social Networking—Social networking sites such as MySpace and Facebook provide great opportunities for students to link and communicate with students from all over the world. For diverse students, these sites can promote and improve their writing abilities. As always, teachers need to monitor students' participation for Internet safety issues. Instructional materials are critical for successful teaching in any classroom, especially in diverse and inclusive classrooms where students' skill levels, learning styles, and interests are more varied. There are many exciting options that can help teachers meet the instructional challenges they face. 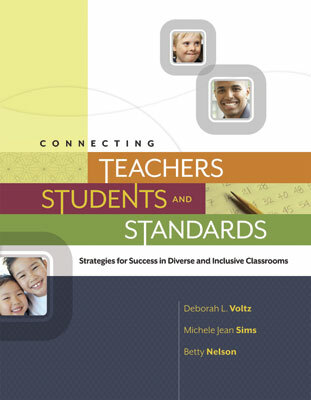 In Chapter 3, we will explore other factors related to the context of instruction in diverse and inclusive classrooms. Bar, C., East, K. A., & Thomas, R. L. (2007). Across cultures: A guide to multicultural literature for children. Santa Barbara, CA: Libraries Unlimited. Knowles, E., & Smith, M. (2007). Understanding diversity through novels and picture books. Santa Barbara, CA: Libraries Unlimited. Davis, K. L., Brown, B. G., Liedel-Rice, A., & Soeder, P. (2005). Experiencing diversity through children's multicultural literature. Kappa Delta Pi Record, 41(4), 176–179. Levin, F. (2007). Encouraging ethical respect through multicultural literature. The Reading Teacher, 61(1), 101–104. Lowery, R. M., & Sabis-Burns, D. (2007). From borders to bridges: Making cross-cultural connections through multicultural literature. Multicultural Education, 14(4), 50–54. Teaching Tolerance:www.teachingtolerance.org. This site is a project of the Southern Poverty Law Center. It includes a wealth of information related to culturally responsive instruction. Teachers can request free instructional kits related to topics such as the civil rights movement and the holocaust. This site also includes reviews of multicultural children's literature. Cooperative Children's Book Center:http://www.education.wisc.edu/ccbc/books/multicultural.asp. This site includes annotated bibliographies of high-quality multicultural children's literature for grades K-12. Multicultural Children's Literature:http://www.multiculturalchildrenslit.com. This site includes annotated bibliographies of high-quality multicultural children's literature for grades K-12. Dell, A. G., Newton, D. A., & Petroff, J. G. (2008). Assistive technology in the classroom: Enhancing the school experiences of students with disabilities. Upper Saddle River, NJ: Merrill. Shelly, G. B., Cashman, T. J., Gunter, R. E., & Gunter, G. A. (2010). Integrating technology and digital media in the classroom. Boston: Thomson. Bausch, M. E., & Ault, M. J. (2008). Assistive technology implementation plan: A tool for improving outcomes. Teaching Exceptional Children, 41(1), 6–14. Columbo, M. W., & Columbo, P. D. (2007). Blogging to improve instruction in differentiated science classrooms. Phi Delta Kappan, 89(1), 60–63. Davis, A., & McGrail, E. (2009). "Proof-revising" with podcasting: Keeping readers in mind as students listen to and rethink their writing. The Reading Teacher, 62(6), 522–529. Lucking, R. A., Christmann, E. P., & Wighting, M. J. (2009). Podcasts and blogs. Science Scope, 33(3), 64–67. Putnam, S. M., & Kingsley, T. (2009). The atoms family: Using podcasts to enhance the development of science vocabulary. The Reading Teacher, 63(2), 100–108. Simpson, C. G., McBride, R., Spencer, V. G., Lowdermilk, J., & Lynch, S. (2009). Assistive technology: Supporting learners in inclusive classrooms. Kappa Delta Pi Record, 45(4), 172–175.